Kit choice is very subjective and everybody will have their own personal preferences. That said, I am always available to talk you through suitable kit choices for your chosen expedition. Contact me. You will be sent a full kit requirement list in your joining instructions dossier for your your chosen expedition or tour. All team members enjoy a 15% discount at Cotswold Outdoor and/or Snow+Rock. Discount codes will be provided to teammates upon booking and you can access the code through your user portal and in the joining dossier. That said, here I’ll highlight a few general things you should look for when purchasing your personal kit and clothing for tours but especially expeditions. Your boots are the most important item of kit and one you will almost certainly need to buy. Take lightweight trainers or strap-on flip-flops to wear at the camp site to rest your feet. Feet come in all shapes and sizes, so try many different boots to find the one that best suits your feet. Make sure your boots are well worn-in before joining the expedition. TIP: On high mountain expeditions like my Kyrgyzstan snow leopard expedition snow boots are the better choice. Firstly because there will be snow in the high places, but mainly because you will be walking through wet mountain flower meadows where the wet grass will quickly strip all the waterproofing off normal walking boots thus getting your feet wet, especially when crossing rivers. Snow boots are plastic and waterproof. You should never wear cotton socks on an expedition. Getting the right socks for your expedition can make a huge difference. Walking socks are designed to minimise blisters with padding and moisture protection fabric. Good walking socks are the key to an enjoyable expedition by helping to avoid blisters. If you wear a smooth liner sock, and then your hiking sock on top, it can help to reduce blisters. A liner sock is ultra-thin, worn under a walking sock to aid dryness and hygiene. Liners can be easily washed and dried overnight, keeping fresh socks next to your skin. Always carry a spare pair of socks on a hike, if your feet get wet you could very easily damage your skin, stop and change your socks when you get an opportunity to do so. Try to get the best you can afford. Ultra-lightweight and breathable fabrics are great but expensive. Under your outer waterproof layer you'll need lightweight, fast-drying inner and middle layer clothing. Expedition clothing is specially designed to be close fitting and breathable. Your base layer will be breathable and tight-fitting to absorb and wick-away moisture from the body. Your mid layers should be warm and insulating, like a fleece. I recommend you wear lightweight trousers rather than shorts to protect your skin. Even in the tropics. Use multiple layers rather than just one. Removing layers allow flexibility to regulate body temperature and stay dry. LED head torches are great for use at camp as they leave your hands free. Your expedition leader will carry an extensive first aid kit, but you should also carry a small one of your own. Take a 'Compeed' style blister kit. Ensure that your personal kit allows for allergies, conditions or medication you have or need. Carry a small bottle of high-factor sun cream. Think about the size and get the smallest one that can fit the kit you need to carry. Look out for load transferring, adjustable back system and ensure you are fitted to your rucksack. Make sure your pack transfers the weight of your kit to your hips and not on your shoulders. Line your rucksack with a rucksack liner to keep everything dry. If you're a photographer with extra kit get the rucksacks with an outer zipped door so you can get quick access to your gear. Also bring a small day-sack. It is so important to have a sleeping bag designed to give you comfort at the lowest minimum temperature. Always pack your sleeping bag in a waterproof bag to keep it dry. Synthetic filler lowers the cost of the sleeping bag and will keep you warm if it gets wet. However it is much heavier and bulkier than a down-filled sleeping bag. Down provides by far the best insulation, is ultra-lightweight, easily compressed into a small package, very warm and long-lasting, but more expensive. Must be kept dry. If you're buying a sleeping bag for one of my high mountain or arctic expeditions then you're going to need a 4-season sleeping bag. If you're buying a sleeping bag for the tropics then you need to put more thought into your choice. Firstly, evenings are hot, but the nighttime air gets much colder in the middle of the night, only to warm-up again in the morning. You will probably be sleeping in one of my hammocks in the tropics. Hammocks are great but they make climbing into a sleeping bag difficult. So I recommend purchasing a thin down-filled quilt. These are often quite difficult to find so if you're struggling to find one contact me, I have a few new ones I can sell. The best way to use a quilt or sleeping bag whilst sleeping in a hammock in the tropics is to completely unzip it. Start the evening sleeping on top of it while the temperatures are still high. Then when it turns colder in the middle of the night you can quite easily pull the cover over to stay warm without any struggling in the hammock. A sleeping mat is essential when sleeping on the ground, it insulates you from the ground and provides some cushioning. A ¾ length mat will save weight, you don't really need a mat beneath your legs and feet. Self-inflating air mats cost more but insulate better and are much more comfortable. I provide the tent for you to use on my expeditions. You don't need to bring your own unless you want to bring your own. If you do want to bring your own then please let me know before we depart. Tents are either 1-person or 2-person tents. A 2-person tent saves weight and can be carried in parts by two people. Body heat from two people maintains ambient temperatures in the tent better. I provide the hammocks on expedition. If you want to bring your own then please let me know before we depart. The hammocks I use are 'Warbonnet' Blackbird or Blackbird XLC. These are handmade in the USA and are widely regarded as the best in the world. 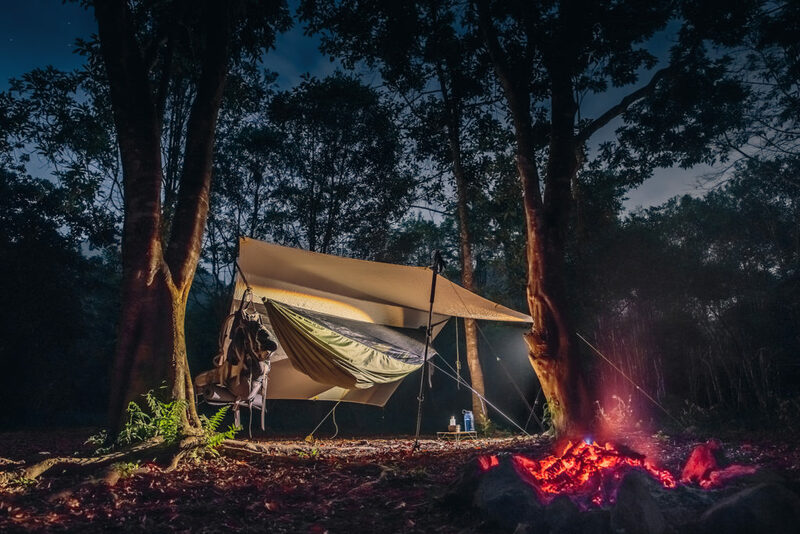 The hammocks are fitted with a mosquito cover, and have an independent fly-sheet. They have a foot-well for optimal comfort, and they even have a shelf to store your clothes and gadgets. I can tell you now the hammocks are far more comfortable than you might imagine. I find them more comfortable than my bed and most would agree. You can sleep in almost any position even curled-up or on your front. You can't fall out of them. They're easy and fast to string-up and take-down, and very light weight. I'm sure you'll find them more comfortable and easy to use than you think.